It seems that the predominant trade show strategy for exhibitors is the Dog & Pony version where they display their products, pass out tchotchkes, drink coffee and attend parties or events. These shows are great. They are lots of fun. Success at these kinds of shows is expressed in terms of feelings and emotions as in, “what a great show!” Or, “we heard a lot of nice things about our new products,” or “the booth looked great!” Dog & Pony Trade Shows have a lot in common with vacations and holidays. This isn’t to say that they aren’t a lot of work (they are), but they focus on socializing, schmoozing, and fun. Contrast this with Trade Show Samurai Strategy. This is where the booth is staffed with disciplined Trade Show Samurai who are hell-bent on collecting leads and uncovering valuable sales opportunities. These shows are a rush. The feeling of extreme productivity is infectious not only for the Trade Show Samurai, but also the attendees. The busier the Trade Show Samurai are the more attendees flock to the booth just to see what’s going on. Success at these shows is expressed in quantifiable terms such as the number of leads generated or the overall cost per lead (CPL). Even the parties and events are discussed in terms of the opportunity they uncover. The pinnacle of success is called Trade Show Nirvana. Both strategies are at opposite ends of the trade show strategy spectrum even though both are at intended to increase sales. Both strategies involve both work and fun. 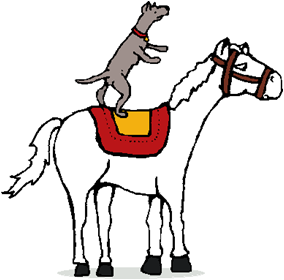 More and more, however, the Dog & Pony strategy is becoming harder to justify financially. Company managers and executives are increasingly sensitive to return on investment and the Trade Show Samurai strategy produces quantifiable results that are much easier to justify. As a Trade Show Samurai, I see Trade Show Nirvana as the best of both worlds. I get to enjoy the show and show my impact to the bottom line. Achieving Trade Show Nirvana isn’t impossible. It requires that you and your fellow booth staffers learn the ways of the Trade Show Samurai and that you apply the skills you learn with discipline and consistency. Getting the best of both worlds is entirely within the grasp of literally any trade show exhibitor. You can even bring a few dogs and ponies if you want.